A Rocken Good Time! | Delicious! Delicious! It is a dim and only partially-full night at the restaurant. Caryn and Matt sit at a small table in the bar area. Their glasses are empty and very little evidence of their comforting pretzel burgers can be found on their plates. They both, however, cannot refrain from snacking on the rest of the truffle fries. She pops another fry in her mouth. Are you gonna ask him? Matt pops two or three fries in his mouth. Aw, come on! I’ll buy you dessert. I hear they have a worthwhile chocolate pudding cake, but I’m really full. The WAITER returns to take their plates. Caryn and Matt scramble for the last of the fries. Caryn scrunches her face and whispers under her breath. Caryn instantly switches gears and puts on her brightest smile for the waiter. I don’t suppose you would part with the recipe for the pretzel rolls. The waiter laughs and back-peddles. Uhhhhh…I don’t know. Chef Hans is gone for the night. She nods as the waiter leaves and then she glares at Matt. A lot of help you were. I’ll get the tab to make it up to you. You can pay the valets. Caryn accepts this concession for a moment. Matt hands the waiter some cash when he brings the check. Wait! The parking is more than my burger! 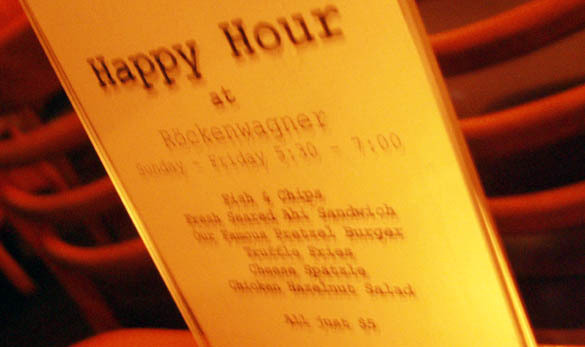 Sit at the bar because the five-dollar Happy Hour menu is a downright steal! The pretzel burger deserves to be called famous and simply must be served with their extra crispy french fries. This entry was posted for April’s Dining Out: Bar Fly theme over at The Delicious Life. hi. you can search inside hans rockenwagner’s book on amazon and the recipe is there. mmm, pretzel rolls. I think these rolls were called bretzeln when I did an exchange summer in Southern Germany. You’ve inspired me to put a hold on Rockenwagner at my local library! Plus I’ve got a bierock for lunch. Your’s is my new favorite recipe blog! Thanks. Oh, wow!!! Thanks so much for the tip about where to find the recipe. I can’t tell you how long I searched for that recipe. I guess I never thought Chef Hans might have printed it in his cookbook. Duh!! Well, this blog is worth it for that tip alone! Rose, I’ve had similar rolls in Switzerland. I really love them. Glad you tried the bierocks! !